Louisville-based black metal outfit ANAGNORISIS begins a run of Midwestern tour dates this week, the final shows before the band makes a lineup transformation and prepares for its next metamorphosis. Following their recent set at the Louisville Deathfest at the end of September, where they unveiled the Peripeteia LP live in its entirety for the first time, ANAGNORISIS will tour through the Midwest this week. The band will play Hamtramck this Oct. 26, with shows in Columbus and Indianapolis Friday and Saturday, the final set taking place in their hometown of Louisville this Oct. 29. 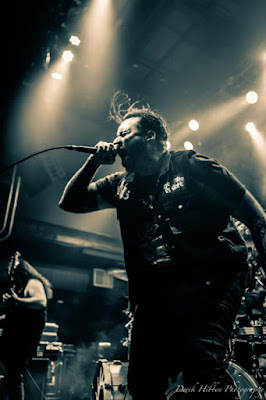 These shows will mark the final performances with ANAGNORISIS for keyboard player Samuel Hartman, who will be leaving the band at the end of the year to pursue new ventures. The band will storm through their native Midwestern homeland one last time with Hartman this week, which will make these shows extra special and their performances even more epic. ANAGNORISIS' Peripeteia is available on CD, cassette, 2xLP, and digital formats; place orders through the band directly at Here. Released in the Autumn of 2016, ANAGNORISIS' triumphant Peripeteia LP was called by Noisey, "black metal at its most grand, coldly melodic and unapologetically over-the-top without stumbling into wimpy, overly symphonic territory... on Peripeteia, one gets the distinct impression that they're finally satisfied-not enough to stop, or to slow down, but to push even harder." Decibel Magazine reported, "ANAGNORISIS certainly doesn't pull any sonic or emotional punches on its majestic, seriously affecting gut-punch sophomore full-length Peripeteia -- a powerful blend of forward-thinking, nuanced black metal and excerpts from circa '82-87 family recordings he found on two cassette tapes after his father's death." Invisible Oranges offered, "Snippets of audio recordings from Kerr's childhood pepper these songs and hint at an unhappy domestic life. Combined with the band's sometimes rough and tumble riffs, not to mention prolonged song lengths, these tape snippets evoke Shining's masterful V: Hamlstad album... but the knowledge that these samples don't come from a film give the story the weight of reality."